When I was a child survivors of the horrors of World War I were still plentiful, even if they rarely spoke of their experiences. Sadly, they have all died, and their children, those who survived the war and atrocities which came only twenty years later, are now ageing and dying. In many ways it is a miracle that so many of them have managed to live this long: they inhabit bodies weakened by malnutrition, battle wounds, torture and forced labour, while their minds and spirits have been indelibly scarred by the savagery and death they lived through. But surviving is what they did, back in the 1940s and ever since, and while we still have them among us we can only be grateful to have living reminders of events we should never want to repeat. And yet... today also marks 100 days until the British General Election, and already so much of the rhetoric focuses on immigration in an ugly, angry way. There has been a rise in anti-Semitic attacks, as well as incidents against Muslims, leaving people feeling scared and vulnerable - ironically, we're told the anti-immigration rhetoric is because it's the British people who feel insecure and fearful of immigrants! 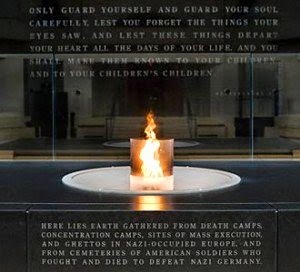 How have we come to this, in this country which fought the Nazis, that we can so easily forget the fear-based hatred and scapegoating that caused the Holocaust and persecution of minorities? How is it that we too, and so many other European countries, can stumble towards repeating the errors which allowed the reign of Nazism, even though we suffered their destructive consequences? The Holocaust and the General Election may seem worlds apart, but they're not; there's a slender, ugly thread connecting them, and that thread needs to be broken before it becomes too strong. Earlier today one of my friends posted this photo on Facebook. The line from Deuteronomy is especially powerful and especially necessary. While the survivors of the Holocaust are still with us we need to listen to and learn from them, as a warning to ourselves and subsequent generations. If we are to say - and truly live - never again - then we must guard ourselves and guard our souls, lest these things depart our hearts; lest we, and those who follow us, disastrously forget.